Vedic Mathematics workshop at Borivali for students of grades 6th & 7th. Workshop on Vedic Mathematics for 5th graders and above at Chinmaya Vrindavan, Cranbury, New Jersey, USA. Workshop on Algorithms and Combinatorics for 9th graders and above at Chinmaya Vrindavan, Cranbury, New Jersey, USA. Vedic Mathematics course at Dahisar for students of grade 5th, 6th & 7th. Vedic Mathematics is an excellent tool for developing interest towards numbers and enable faster calculations. In this course, the students will get to explore the subject through pattern-observation, group discussions and puzzles. A residential camp on Mathematics and Music at Chinmaya Vibhooti, Kolwan, Pune. Permutations and Combinations developed in Europe a couple of hundred years ago but in India this branch of Mathematics was quite developed as long as 2300 years back. In this camp, we will be discussing P & C through music and poetry as how it was discussed in ancient India. Focus will also be given on algorithms and proofs which forms a foundation for Computer Science. A residential camp on Vedic Mathematics at Chinmaya Maauli, Pune. Vedic Mathematics is an excellent tool for developing interest towards numbers and enable faster calculations. In this camp, the students will get to explore the subject through pattern-observation, formulating conjectures and trying to prove them. Registrations limited to 35 participants. For more details and registrations, click on the below flyer. Vedic Mathrix 2017 is the annual residential camp on Indian mathematics conducted by Chinmaya International Foundation and School of Vedic Maths. The camp aims at creating a deeper understanding of Mathematics and taking the participants through a tour of deeper-level understanding of geometric-algebra and history & development of mathematics. Five days of the camp will be filled with fun and stress-free learning of Mathematics through classroom sessions, group discussions and indoor & outdoor activities / games. The serene environment of Chinmaya International Foundation gives a different experience of learning. Workshops on Algorithm Design in Nerul (Navi Mumbai) and Borivali (Western Suburban Mumbai) in April first fortnight. Three seats left in both the batches in Borivali and few seats left for Nerul batch. 9A, Ho Chi Minh Sarani, Kolkata 700071, WEST BENGAL, India from 28th Dec-30th Dec 2016. The conference, organized by IAVM and sponsored by the Indian Council for Cultural Relations(ICCR) promises to be first of its kind event, where the research paper discussions, global projects presentations, and hands-on workshops will be held over a period of three days. Please click on the link below to register for free, and to know more about the conference. Workshop on Quantitative aptitude and Vedic Mathematics for Engineering students at Vidyavardhini College of Engineering (Vartak College), Mumbai. Workshop on Mathematics for 5th grade students at Mallya Aditi International School, Bangalore. Games based on Mathematics for anyone at Nerul Gymkhana, Nerul, Mumbai. Workshop on Vedic Mathematics at Davangere, Karnataka. Workshop on Vedic Mathematics for Mathematics teachers students at Chinmaya Tapovanam, Palakkad, Kerala. Session on History and Development Mathematics in India for students of Youth Empowerment Program (10th batch), Chinmaya Mission, Kolwan, Pune. Workshop on Quantitative aptitude and Vedic Mathematics for MBA students at Institute of Management Education Research and Training, Pune. Seminar on Vedic Mathematics for teachers at Chinmaya Vidyalaya, Coimbatore, Tamil Nadu. Workshop on Vedic Mathematics and Ancient Indian Mathematics for 6th-8th grade students at Pushpalata Matriculation School, Tirunelveli, Tamil Nadu. Workshop on Vedic Mathematics and Ancient Indian Mathematics for 6th-8th grade students at Pushpalata Vidyamandir, Tirunelveli, Tamil Nadu. Workshop on Quantitative Aptitude & Vedic Mathematics for Computer Engineering students at MMIT, Pune. Workshop on Quantitative Aptitude & Vedic Mathematics for Engineering students at Thakur College of Engineering, Kandivali, Mumbai. A residential camp on Magic Squares and Cryptography at Chinmaya Vibhooti, Kolwan, Pune. Magic Squares have been a fascination for people of all ages since centuries. Earlier, it was considered to be a part of recreational mathematics and mysticism. But today there are many other areas where application of Magic Squares can be seen. Cryptography is one such area. In this camp, the topic of Magic Squares will be explored in detail along with some ancient Indian ways of coding and decoding information. For details, click on the flyer. Registration closes at 85 participants. Registrations have crossed 55 as on Feb 29th. Vedic Mathematics is an excellent tool for developing interest towards numbers and enable faster calculations. In this camp, the students will get to explore the subject through pattern-observation, group discussions, games and puzzles. Vedic Mathrix 2016 is the annual residential camp on Indian mathematics conducted by Chinmaya International Foundation and School of Vedic Maths. The camp aims at creating a deeper understanding of Mathematics and taking the participants through a tour of deeper-level numerical and geometrical aspects of number system, triangles, quadrilaterals, ancient yantras and so on along with geometric-algebra, history and development of mathematics. Five days of the camp will be filled with fun and stress-free learning of Mathematics through classroom sessions, group discussions and indoor & outdoor activities / games. The serene environment of Chinmaya International Foundation gives a different experience of learning. Time: 4:00 - 6:30 pm IST (10:30 am - 1:00 pm GMT; 6:30 - 9:00 am EST) on both days. Workshop on Quantitative Aptitude & Vedic Mathematics for Final year Engineering students at Saraswati College of Engineering, Kharghar, Mumbai. Workshop on Quantitative Aptitude for Engineering students of Marathwada Mitramandal Institute of Technology, Lohegaon, Pune. 5-day workshop on Logical Reasoning for middle school students at Chinmaya Vidyalaya, Tarapur, Maharashtra. Seminar on Vedic Mathematics during Mathematrix 2015 at Podar College, Mumbai. 3-day workshop on Vedic Mathematics for First year Engineering students at Sanjay Ghodavat Group of Institutes, Kolhapur, Maharashtra. 5-day workshop on ancient Indian mathematics for middle school students at Pushpalata Vidyamandir, Tirunelveli, Maharashtra. Geometric-algebra - the correlation between Geometry and Algebra. Vedic Mathrix is an annual residential camp on Indian mathematics conducted by Chinmaya International Foundation and School of Vedic Maths. The camp aims at creating a deeper understanding of Mathematics and taking the participants through a tour of deeper-level geometrical aspects of triangles, polygons, circles, cyclic quadrilaterals, and so on along with geometric-algebra, history and development of mathematics. Five days of the camp will be filled with fun and stress-free learning of Mathematics through classroom sessions, group discussions and indoor & outdoor activities / games. The serene environment of Chinmaya International Foundation gives a different experience of learning. - Enrol for any of the workshops of your choice and make your vacation meaningful and enjoyable. - A wonderful opportunity for teachers and parents to learn Vedic Mathematics for an exclusive workshop of Teachers’ Training and Parents’ Training in Vedic Mathematics. - Two valuable Seminars in addition to the Workshops which can be a turning point in your life. - Check out the below flyer and forms for complete details. Session for Quantitative Aptitude for Engineering students at Theem College of Engineering, Boisar, sub-urban Mumbai. Session for Quantitative Aptitude for Engineering students at ARMIET College of Engineering, sub-urban Mumbai. Session for Quantitative Aptitude for MBA students at Indira Global Business School (IGBS), Pune. Raising A Mathematician Competition, an inter-school Math competition for students from 6th - 10th grade in suburban Mumbai. Introduction to Vedic Mathematics and session for Quantitative Aptitude for Engineering students at Theem College of Engineering, Boisar, sub-urban Mumbai. Introduction to Vedic Mathematics and session for Quantitative Aptitude for MBA students at Institute of Management Research Education and Training (IMERT), Pune. 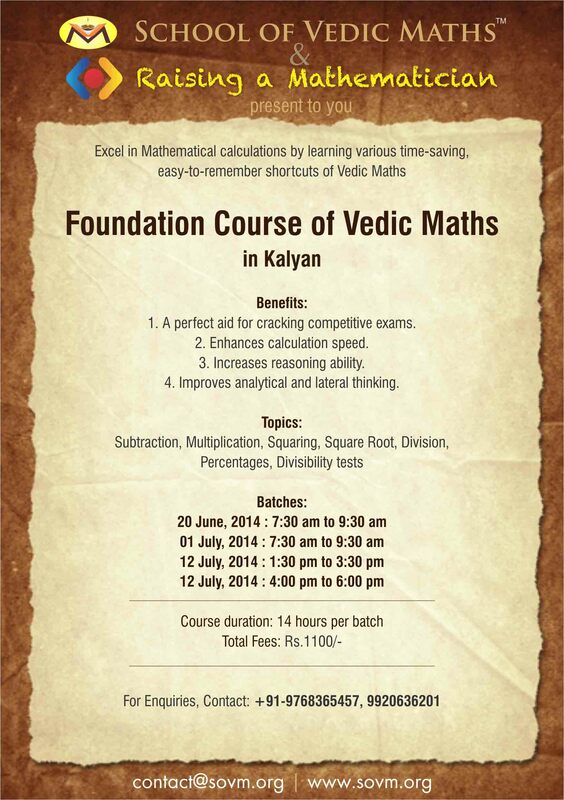 Crash Course on Vedic Mathematics for students appearing for competitive exams. Seminar on Vedic Mathematics during Mathematrix 2014 organised by Mathematics Association of Podar at Podar College. Online Classes on Vedic Mathematics, Mathematics, MS Excel and Sanskrit. After the success of four batches of Foundation Course on Vedic Mathematics in May 2014, we have decided to have four more batches for students, parents and teachers, in Kalyan West, Mumbai. A week-long Foundation Course on Vedic Mathematics for students, parents and teachers, in Dombivli West and Kalyan West, Mumbai. 'Raising A Mathematician Training Program', a 6-day residential camp at Ram Ratna Vidya Mandir for 100 selected students between 13 and 15 years of age throughout India to induce a 'research-mentality' in the students by giving them higher level mathematics. The first of its kind in India. Vedic Mathrix 2014, a 5-day Residential camp at Chinmaya International Foundation, Kerala organised by CIF and School of Vedic Maths.